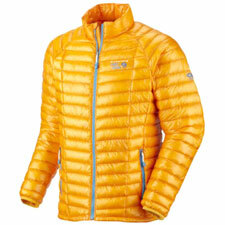 Think of Mountain Hardwear's 6.7-ounce Ghost Whisperer as a high-end heat infusion. If you want the best possible warmth-to-weight ratio in an ultralight top, this is it. The insulated Ghost Whisperer pairs 850-fill down with an incredible 7x10 denier nylon—a next-generation fabric developed as part of Mountain Hardwear's Ueli Steck Project. The fabric's super-tight weave is naturally down-proof, windproof, and highly water-resistant. Yes, you will pay dearly for all these advances, but it will absolutely be worth it. The Ghost Whisperer has a full front zipper, two zip pockets, elasticized wrist cuffs, and a waist drawcord. That pretty much sums up its frill list. When not in use, you can stuff the jacket inside its own pocket. How much warmth can you get from a 6.7-ounce jacket? More than you'd expect. I was very pleasantly surprised by the Ghost Whisperer's ability to shed wind and retain warmth while skiing on a chilly Alpine day at Mammoth. Subjectively, the Ghost Whisperer seems at least as warm, and quite possibly warmer, than my North Face Malache Fleece top. Unlike a heavyweight fleece, however, the Ghost Whisperer is light and supple—it never feels bulky or stiff against your body. Protect it with a shell, and the Ghost Whisperer is a fine insulating layer for cold-day Alpine skiing. But it is in backcountry and mountaineering applications where the Ghost Whisperer truly proves itself indispensable. Compared to my ultralight down vest, the Ghost Whisperer adds exactly two ounces in weight, but incomparably more warmth. This makes the Ghost Whisperer the paragon of use-it-when-you-need-it, stuff-it-when-you-don't insulation. Liabilities? Price, obviously. As well, you'll want to be careful you protect the Ghost Whisperer's ultrathin fabric from sharp points, edges, and even branches. As with all down products, users in wet climates will need to take extra care keeping the Ghost Whisperer dry (or at least allow time for drying between use). Still, my overall impression is that this is must-have gear. Recommended.